There's no written rule that says football shirts have to reflect the fashion trends of the era in which they're born, and yet many do. Think of the football shirts of the 1960's: basic, functional, unshowy... Until Twiggy started wearing spangly mini-skirts, the word 'flair' hadn't even been invented. Then when the 1970's arrived, colour flooded into everything from TV programmes to home décor as creativity and imagination underpinned art, architecture, clothing and much more besides. And after that, the 1980's came along, where fashions became... well... 'sensible.' But you know what? By the early 1980's, we all needed a bit of sensible. It was time to take stock of what had gone before and forge ahead with understated design that was modern and sleek without being ostentatious. This was the very essence of how England's 1982 World Cup shirt came to be. Thanks to Admiral Sportswear, the England team had moved from basic unambiguity to tentative boldness with their 1974 kit, but six years down the track, it was time embrace a new decade. Out went the old-fashioned stripes down the sleeves and in came silky polyester, a continental-style collar and bold shoulder panels. Naturally enough, it rubbed a few people up the wrong way. BBC TV commentator Barry Davies, upon seeing England wearing the new kit for the first time against Argentina in 1980 said "England wearing their new kit today... although why it has to have all the colours of the Union Jack is beyond me." Truth be told, the previous kit had also featured the same red, white and blue, but the shirt was predominantly white. Now... well... this. The thing is, half the world's football teams seemed to be wearing the three stripes of Adidas on their shirts by this point, and very stylish they looked too. Adidas had become THE football brand to wear, whereas Admiral... well, to put it politely, their day had been and gone. Their iconic designs of the 1970's reflected the decade perfectly but were suddenly out of step with the 1980's. Even this new shirt that would go on to be worn at the 1980 European Championships and the 1982 World Cup somehow didn't have the allure that Adidas could provide. And yet, we all missed the point and still do. At the start of the 1980's, fashion trends were becoming more modest, more muted, more... 'M&S'. Shirts didn't need wide collars, fiddly detail and wacky colours. This was a new era where 'modern' and 'smart' were the watchwords, and the new England shirt embodied those values perfectly. 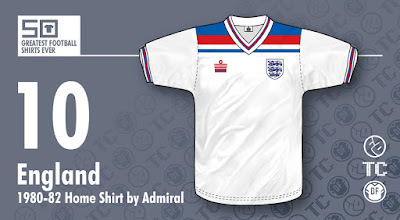 Finally, let it not be forgotten that you, our knowledgeable Football Attic audience, have already declared this your favourite England shirt of the last 50 years - a considerable achievement given its attachment to a fairly ho-hum period in English football history. What it does attach itself to, and perhaps why it's already proven to be so popular, is its forward-looking modernity symbolising hope for a bright new future. Yes, football shirt design was capable of being technically better or more exciting, but this was the right shirt at the right time, and executed with great discretion to boot. So there we have it: a shirt whose greatness has been earned through its imperfection, you might say. Not as stylish as Adidas with all their fancy pinstripes, but a neat 'of its era' shirt worn with pride by dozens of players from John Barnes to Kevin Keegan - and there can be no doubt: they all looked absolutely bloody great in it.